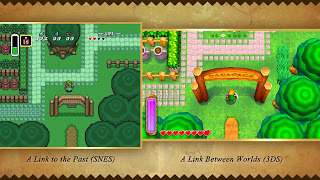 Cody's Reviews: The Legend of Zelda: A Link Between Worlds. LOZ: A Link Between Worlds is the newest game added to the Zelda series. A Link Between Worlds is a direct sequel to A Link to the Past for the SNES. After many long years they finally decided to do a sequel to the original. A Link Between Worlds is pure gold and is a must own for everyone. The game is like the original where the camera is a top view camera of Link. 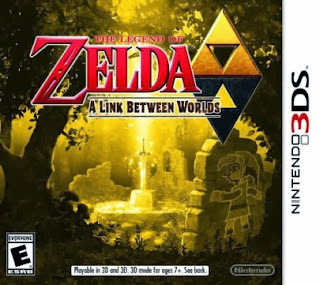 It does an excellent job as staying to it's roots from the original with the camera view, the enemies, the temples, and you are in the exact world from A Link to the Past. You start off by sleeping in of coarse and the Blacksmith's son comes to wake you up because you are late as usual for work. When you arrive to the blacksmith's shop he is talking to someone very important. As soon as the important figure leaves the blacksmith proceeds to give you trouble for being so late. After he finished yelling at you he notices that the man forgot his sword. Your errand is to find the man and give him is sword. From this point on, your adventure begins. A Link Between Worlds uses the 3DS extremely well. The game runs at a smooth 60 frames per second with no FPS drops at all. The biggest feature I love about this game is you can do the temples in any order you choose. You don't find your items in the dungeon anymore such as the bow or hook shot. 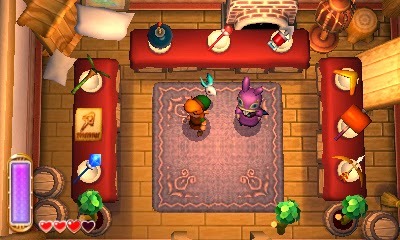 Instead you can rent out all of the items or purchase them for yourself with rupees. This is a very smart thing to be added to the game because with this feature, the game allows you to do any of the temples in any order you choose. There is not a wrong way of doing things. This makes the world feel very open. The Shop where you buy/rent items! Each temple is fun with clever boss mechanics in each temple. Some of the bosses are beyond easy but what do you expect in a Zelda game now. There will always be a few easy ones. As you progress you discover that you can go into an alternate Hyrule. This place is called Lorule that is ruled by Zelda's counterpart Hilda. In order to access this world you are able to turn into a painting and walk along walls into tears which teleports you into Lorule. Although the overworld is largely the same as that of A Link to the Past, all the dungeons are totally new. Exploration of dungeons utilize the game's 3D effects and feature Link jumping between levels to solve puzzles and advance. It feels very smooth when you transition into new areas. Like in previous Zelda titles there are always collectable items to be found. When you find all of the babies you get a new attack for your sword. Every time you return 12 at a time the mother will upgrade any of your items of your choosing to make them more powerful. Rupees are much more important in this game because you have to buy the items and they are not cheap. However, rupees are extremely easy to find and add up quickly. Overall the gameplay is truly remarkable. It has a lot of nostalgia for the old fans and well as some new ones for people who started the series later on. This game has something for everyone. The world is huge, lots to explore, lots of puzzles, and collectables. All of these encourage the play to explore both worlds of Hyrule and Lorule. The game follows the top-down two-dimensional gameplay of various Zelda games, especially A Link to the Past, though it is now presented with stereoscopic 3D graphics when played on the Nintendo 3DS. The top screen is used as the main screen, while the bottom touch screen contains the map, gear, and items. The loading screen consists of a black screen with a Triforce in the lower right corner. It runs smoothly at 60 FPS with new reduce in frames anywhere in the game. It is very colourful, the environments are large and very beautiful and full of life. 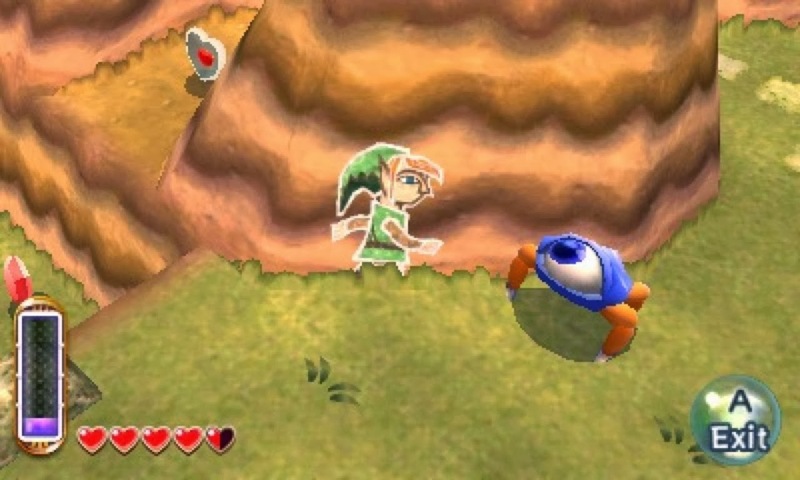 The game features slightly updated sound effects from A Link to the Past. The music tracks are arrangements of the originals. In addition to the music from A Link to the Past, the Streetpass battle mode of the game includes two remixed and rearranged versions of the Temple Theme from Zelda II: The Adventure of Link. The Streetpass mode is inspired by the final "Shadow Link" boss fight from the NES game. It sounds fantastic and has a lot of nostalgia while just listening to the music. A Link Between Worlds is a highly recommend, must own game for the Nintendo 3DS. It is one of the best Zelda games ever created. New fans and old fans alike will find something they love about this game. Whether it be the nostalgia, music, graphics, or game play in general, people will find something they love about it. This game provides a lot to do and you can do it in any order you choose to. Fantastic, I hope to see more. Also, when you beat the game, test your skill in Hero Mode. Hey Cody, I really enjoyed the review! I am not a huge Zelda fan but I am considering picking this one up because of the overwhelming positive feedback associated with this particular Zelda. Your review might just make me take the plunge!